Food Costs > How Much Does a Dozen Eggs Cost? How Much Does a Dozen Eggs Cost? A dozen eggs are usually how eggs are sold at the local grocery store, but depending on where you purchase them, you can buy more in quantity. From being a breakfast staple to a necessary ingredient in a baking recipe, eggs are so prevalent, there’s a good chance a package is inside your refrigerator right now. 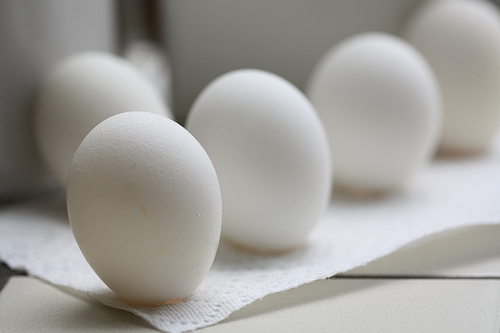 On average, the price for a dozen eggs will range from as low as $2 to as high as $6 per dozen. The price will depend on the brand, the market conditions, the type and the store you purchase it from. The cheaper eggs, which are those that come from hens that are caged, are mass produced by corporations and are considered non-organic, can be anywhere between $1 to $3 per dozen. Free range, organic, pasture raised and/or non-GMO eggs, the most expensive option, can cost $3 to $6 per dozen if they aren’t on sale. As the size increases, the prices can go up as well. Being a commodity, the prices of eggs can increase if the demand and/or feed for the chickens go up, for example. Refer to our table below to see what the major retailers in your area may be charging for eggs. At the time of this writing, the U.S. Department of Agriculture Egg Market News Report said the average cost of a dozen of organic brown eggs retails for $2.30 to $3.50. At a wholesale level, which will often be more than a dozen, the costs can range anywhere from $6 per 24 organic brown eggs to as little as $5 for 86 Grade AAA eggs. Sam’s Club, for example, offers packages that offer anywhere from 18 to as much as 7.5 dozen eggs. Giving Assistant asked its Facebook fans how much they had paid for organic eggs, and according to their study, most had paid about $3.50 for a dozen. AOL did a study, taking a look at the costs of eggs throughout the United States. In New York City, the average cost was $3.57, while in Houston, Texas, it was $2.97. Major brands you can often find in the local grocery store can include Eggland’s Best, Organic Valley, Nature’s Yoke, World’s Best Eggs, Giving Nature and Wilcox Farms. Many grocery store chains also have its own brands such as Whole Foods, Trader Joe’s, Walmart and Meijer. Organic eggs, when compared to the traditional non-organic eggs, will be different since the hens will be fed a diet free from any chemicals, which, in turn, may cause harm to their egg production. To be deemed organic, a hen will not be able to feed on anything that has been treated with any herbicides, chemicals, synthetic additives or pesticides. In order to be labeled as such, the U.S. Department of Agriculture says the hens can’t be kept in tiny cages and the hens must have access to the outdoors. The term “free roaming” and “cage-free” is not meant to be the same thing as the term “organic.” Even though it says free roaming, hens may still be free to reign only while being contained. Don’t assume that even though the egg is brown, it’s going to be organic. The color only indicates the type of breed or the heritage of the bird that laid the egg. Eggs, a common staple for almost all grocery shopping lists, will almost always be on sale at a local grocery store. Either consider stocking up during sales or looking at local circulars to see which store is offering the best deal. Fresh eggs from a farm are almost always the best option in terms of nutrition and value. With that being said, be sure to check out local farmers markets and farms to see if you can find any for sale. Store-branded eggs will always be 20 to 30 percent cheaper than a name branded egg. Purchasing in bulk, as with most food purchases, can save you money. Check out your local wholesale club or even grocery store as you can often find bulk packages of 18-count egg packages. Once in a while, you can find a coupon for eggs that are manufactured by the bigger companies. Check out the local Sunday newspaper, do a search online or even visit the company’s social media pages to see if you can find any deals. Eggland’s Best, for example, commonly have coupons readily available online.